If you’ve seen Mel Gibson’s Apocalypto and think you know all there is to know about Mexican indigenous culture, please stop reading my blog. 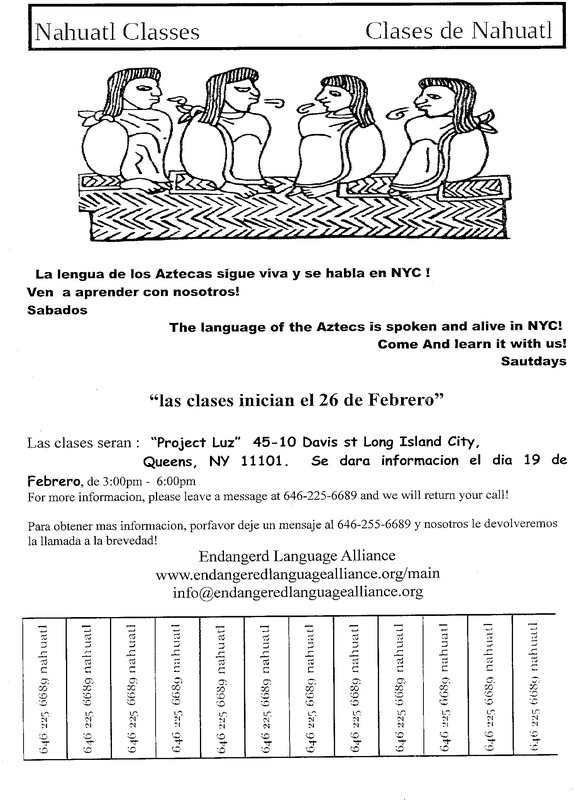 Above, Nahuatl classes are being offered in New York City as part of a project to spread endangered languages. Nahuatl is the most common indigenous language spoken in Mexico and comes in several different flavors of dialects. The Mexican government takes some care with developing awareness for the endangered languages of its indigenous tribes, though not much in the way of making sure the people survive. It remains and insult to tell someone they look “indian” or “indigenous” in Mexico. Ask somebody. Here’s some Nahuatl podcasts and recordings courtesy of the Mexican government. Take a listen, here. The CDI was established as an institution for obligatory consultation on indigenous affairs for the Federal Public Administration complex, as well as for evaluation of government programs and actions and training of federal, state and municipal public servants for improving care for the indigenous population. Here’s some music that’s inspired and funky by Nahuatl Soundsystem. Two Eps are available for download, here.